It seems not so long ago that we finished the leftovers from Thanksgiving. The store windows are red, green and gold, and the aisles are bulging with the latest chatty dolls, action figures, telephones, entertainment centres and satellite remotes. The Christmas season is upon us and the horn of plenty is spilled out in our shop windows and on our television screens. But amidst the plenty, there is need. I was reminded of this the other night as we exited the local theatre. In the neon glow of the gigantic cinema parking lot, a 30-year-old man stood hesitatingly with his dog. He was asking if moviegoers could spare a couple of dollars for a coffee. Like so many of the others scurrying to their cars, I offered a shallow “sorry,” and continued on my way. Of course, not everyone’s need is material. The whole country – apart from a few heartless cowards who kept up the drumbeat of harassment, even as their victim was laid to rest – was shocked and moved by the story of Amanda Todd, the 15-year-old who was hounded to an early death by anonymous cyber bullies. The outraged response of average people and the spontaneous expressions of support among students and educators in particular, demonstrated that we have not completely lost the ability to feel one another’s pain. This was a needed sign of solidarity at a moment when, at least in the political realm, one might be forgiven for doubting our potential for working together for the common good. The political discourse these days, on both sides of the border, is awash in cruel and bitter criticism. Our neighbours to the south have just elected their President and, along the way, every phrase and each facial gesture, was dissected and analysed in agonizing detail. In a trend as regular as the arrival of fall colours, the attack ads flourished as well. Republicans and Democrats did all in their power to misrepresent, belittle and demonize their opponents. Certainly, we are not immune to this style of politics either. It is easier to photoshop demon eyes onto a poster of Ontario Conservative leader Tim Hudak, or smear former federal Liberal leader Michael Ignatieff as an itinerant intellectual than engage with their ideas, however unpalatable we might find them. We live in a moment in which omnibus bills, absentee Ministers, robo-calls and prorogued legislatures are all too common. No one is willing to take responsibility, to engage in rational conversation about the way forward or to take action to address need. But that is not the entire picture. There are people, in all of our communities, who give selflessly in order to help others. This past August we were all inspired by 14-year-old Annaleise Carr of Simcoe, who swam Lake Ontario to raise money for Camp Trillium and its young cancer-stricken campers. And there are countless others who, in less dramatic ways, build community and assist those in need. They are the ones who stock the shelves of the local food bank, who help integrate new arrivals to our towns and cities and who comfort an abused wife or a pregnant teen. The ways to help are only limited by our imaginations and desire to make a difference. 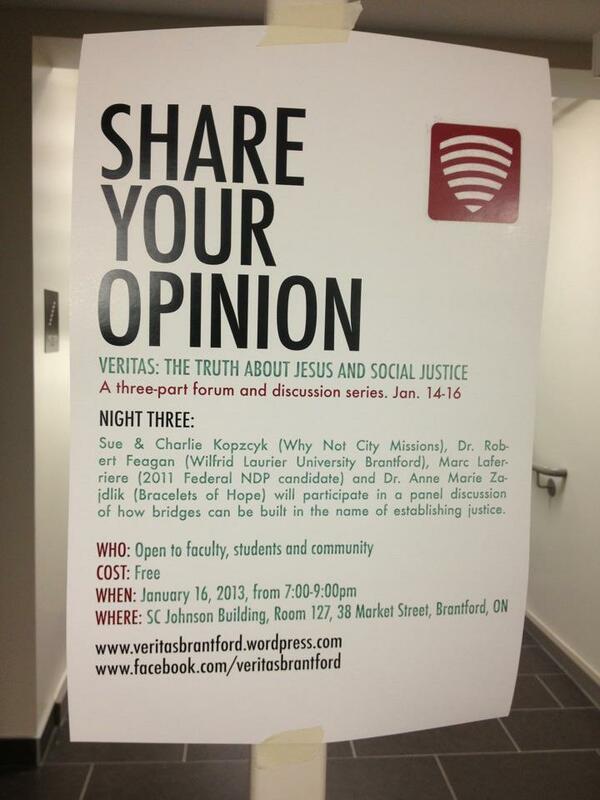 If these themes stir something in you, then you will be interested in an event we had at Laurier Brantford: the Veritas Forum. Veritas was launched in 1992 at Harvard University. It has spread around the world and now each year dozens of events are held throughout Asia and Europe as well as across North America. When asked to choose a theme that would be appropriate for Brantford, our student Co-Directors did not hesitate: given the campus’ orientation, as well as the mobilization of community forces to address various local needs in recent years, social justice made perfect sense. Our first speaker, Dr. Syd Hielema from Redeemer University, spoke about our culture’s skepticism of the church’s ability to work for justice and the church’s struggle to faithfully embody Jesus’s teaching about justice. Our second speaker, Dr. Mary Poplin of the Education Faculty of Claremont Graduate University, shared the principles and insights that she gained when she worked for two months with Mother Teresa and the Missionaries of Charity in Calcutta, and then returned to her position in the secular university. On the final evening, we convened a roundtable discussion, featuring Laurier Brantford faculty member Dr. Robert Feagan, Charlie Kopczyk of Why Not City Missions, Marc Laferriere of the Grand River Community Health Centre where he is a social worker, and Dr. Anne-Marie Zajdlik, founder of the HIV/AIDS charity, Bracelets of Hope. The focus was on how to forge partnerships between people committed to social justice across faith lines. Jesus Christ cared deeply about community and about justice. He maintained that the Kingdom of God was at hand and that the Father desires to give us more and better life here and now. If you are curious about these themes or about the struggle of the Church to embody them, if you care about need, responsibility or solidarity, we hope you will seek out the video of the forum when it is available. Dr. Peter Farrugia is Associate Professor of History and Contemporary Studies at the Brantford Campus of Wilfrid Laurier University. He can be reached at pfarrugia@wlu.ca.